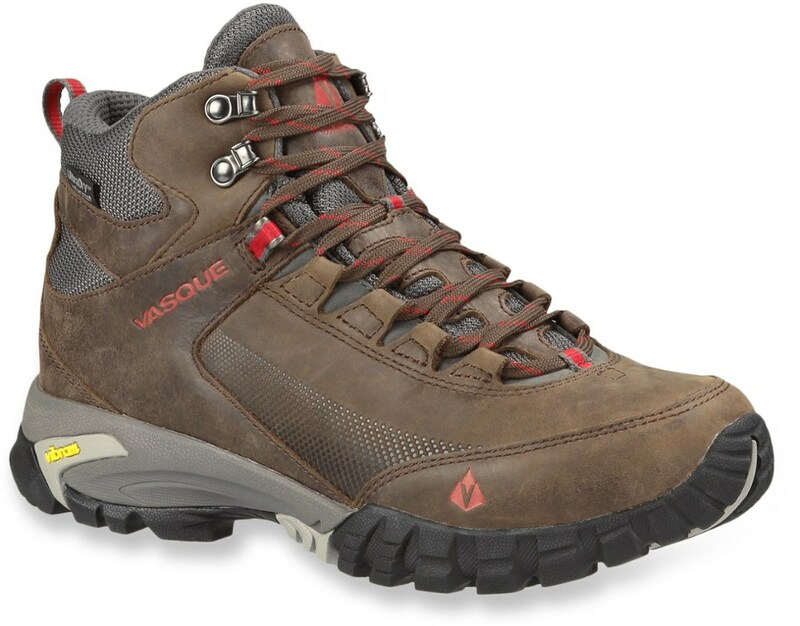 The Keen Liberty Ridge is great footwear for the hiker/backpacker looking for comfort and support over most terrain. Keen Liberty Ridge: The Keen Liberty Ridge boot is well built providing good support and comfort in varied terrain and trail conditions. 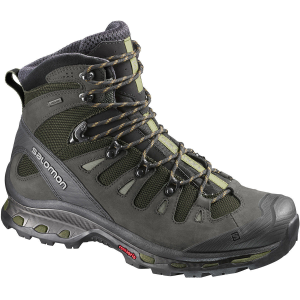 When I tried this boot on at REI, my initial impression was how comfortable it felt immediately. Next I noticed that there was an unusually large toe box with a lot of room inside. I believed at the time that if there was a problem with the boot, it would probably show up in the toe area. 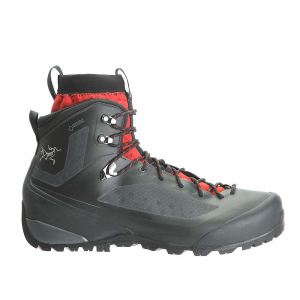 The construction of this boot is perfect for most backpacking and hiking situations. The full grain leather, one piece construction should provide durable dry performance. One thing I have always loved about Keen is the rubber toe bumper. In my other Keen boots I have appreciated this every time I bang a root or a rock, especially at the end of the day! My feet are average width at the toe, and a little high at the instep.I need to take care when fitting boots to make sure the instep does not have pressure points. I have learned this the hard way! For the Keen Liberty Ridge boots, the fit for my foot, size 9.5 is good on my right and a little big on my left, but that has always been a challenge for me. The instep is nice and snug without any pressure points. As I mentioned earlier, there is plenty of room in the toe. 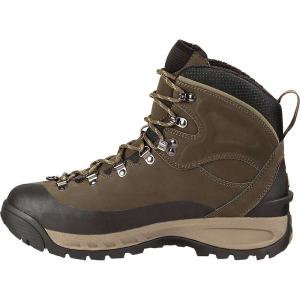 Since this boot is constructed of full grain leather, and featuring a full shank, the weight is a little heavy at 3 lbs 1.4 oz (according to Keen). This is a full height over the ankle boot with a padded full grain leather ankle collar. The laces are constructed with heavy duty stainless steel eyelets and a stability strap at the instep that ensures good heel placement. The soles are compound rubber with good tread pattern that releases mud. There is a molded rubber toe bumper providing protection at the tip of the boot. The soles are constructed with a full shank, but the area at the ball of the foot could use more padding and protection in my opinion. I have noticed that when stepping on rocks where pressure is applied to the ball of my foot, I feel more pressure than I should with a boot like this. 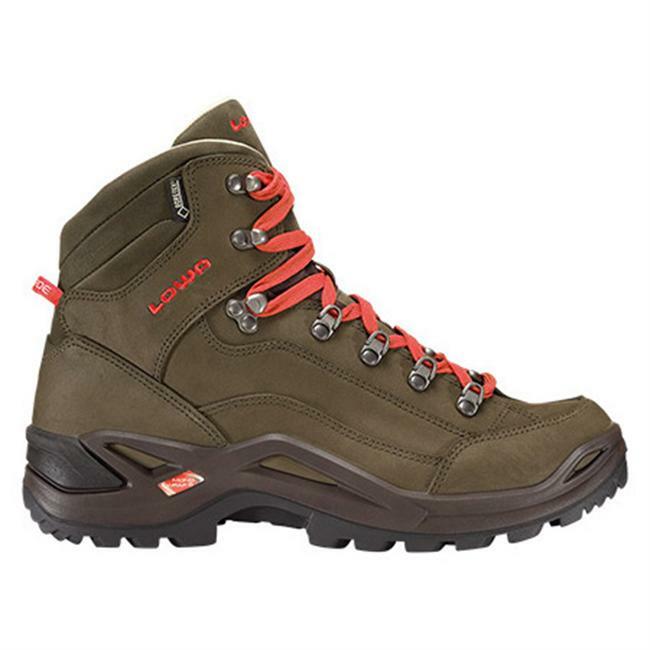 The premium leather that Keen uses in these boots is of high quality and has a supple feel. These boots provide excellent waterproofing protection. 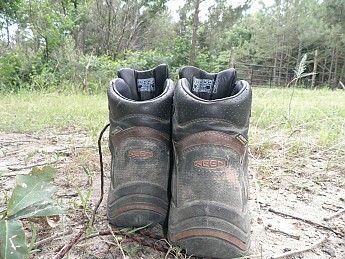 I have used this boot now for 7 months in mostly warmer conditions performing trail work and backpacking. I typically carry a pack weighing in at range of 25-32 lbs. On a 4-day, 40-mile trip in May of this year, I carried all my food and gear weighing in at 32 lbs. 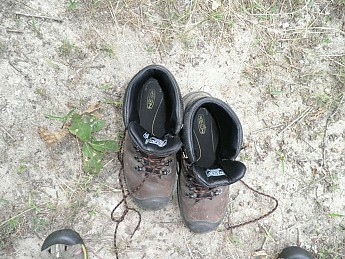 My initial concerns about the extra roomy toe box were dispelled after my first day of backpacking. I completed the 40-mile trip wearing these boots with no comfort issues. One measure of a good hiking boot is if you are not thinking about your feet at all or very little, then your boots are performing as they should. These boots provide excellent support and comfort. I did find them to be a little hot on the feet during warm days. While backpacking, especially on multi day trips, my feet tend to expand a little. I found that the roominess in the toe box was beneficial, and my worries about blisters in this area were dispelled by the end of the first day. I was pleasantly surprised that I had no hotspots or any areas of concern about blisters. I also had no soreness about the ankles or instep contact areas. I enjoyed the extra support and snug fit around the heel. There was no movement and no danger of hotspots or blisters at the heel. The waterproofing is good and I can cross creeks without worrying about dunking my feet. I checked stitching and seams, and all are still tight with no fraying or separating. The soles show no unusual wear, and still have ample tread after a couple hundred miles of hiking, trail work, and backpacking this year. After a particularly hot day of trail work, I noticed that the dye from the ankle collar had bled onto my socks. This may be an issue for some, so I noted it here. Dye from the collar, bled onto my socks and ankles. Thanks Alicia, I did mention that in the "pros". I am surprised at the negative reviews of the boots on other sites. So far I have found them to be an excellent product. Sorry, I missed that the first time through, Soleful. No side pics so I can't tell what the rocker is like on these, but they look a little flatter than my PTCs. Wondering if that contributes to the feeling you describe when stepping on rocks.I've got several years and a lot of miles out of my KEENs. Nice review! Thanks LoneStranger, these boots do not have a pronounced rocker like some heavier duty boots. I have used Keens for years. 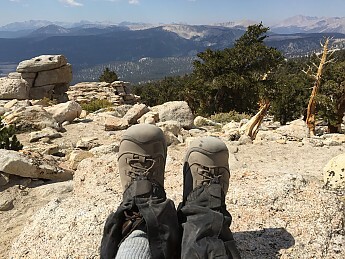 Last year I used Keen Targhee II boots, but they were not quite sturdy enough for backpacking and they unfortunately de-laminated after one season even though they were supremely comfortable. I also have Keen shoes that I wear daily, and Keen Sandals that I love kick around camp in. 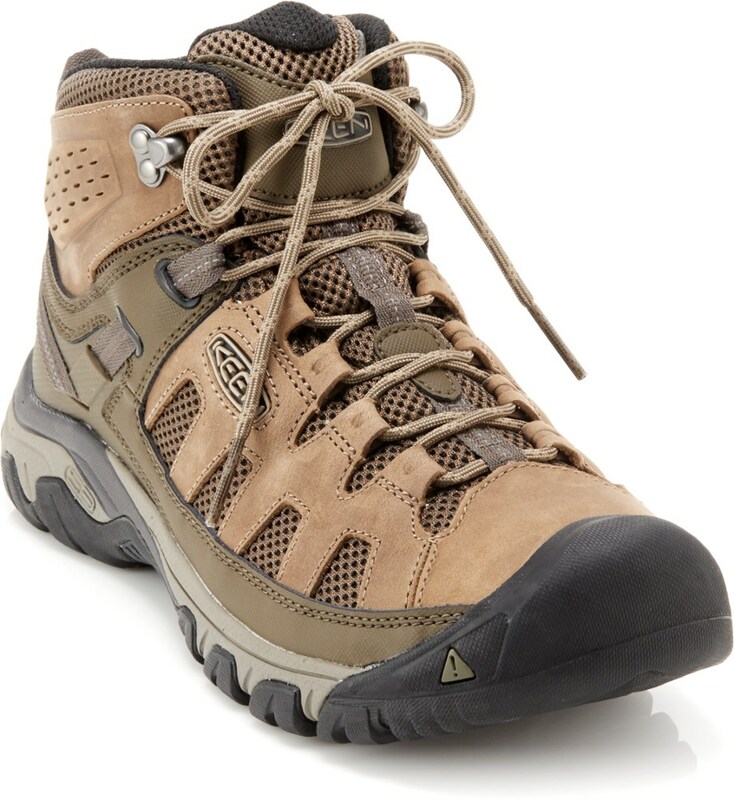 I think the soles on the Keen Liberty Ridge boots have a heavily supported and padded heel yet do not have nearly as much protection at the ball of the foot. Great over the ankle boot for wider feet and those with toe blister issues. Superb support and traction. Durability great after 400 total miles. I have somewhat wide feet and short toes. Keen has the best fit for me. After decades of going through a hundred mile break-in period with new boots, I was surprised to find no such need with Keen. Roomy toebox, wide foot orientation and lacing system did it. This is what my feet have been looking for, for so many miles. Traction, support, water resistance all great, still testing durability but at 250+ mountain backpack miles and about 150 miles of mountain and desert day hikes, still perform as extremely well. I snow-seal a few layers in between backpack trips. Only issue is web eyelets on my version are a little sticky after I use snow seal, but still workable. I see Keen has addressed this in latest version. 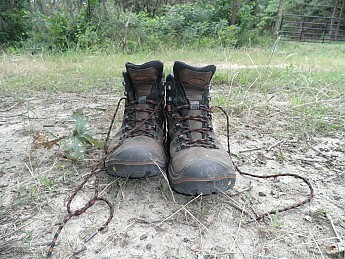 I have used many different hiking and backpacking boots for decades. At 60, I still go backpacking in High Sierras, Rockies, and high deserts of western US. Only written reviews for a few great products. First backpack in Keens was a 35-miler in High Sierras with lot of vertical and day hikes to high ridges on scree. I was amazed at how well my feet did not need blister maintenance. Repeated backpacks continue to prove their durability on-trail, off-trail, on-snow and with crampons. I usually carry 40 - 50 lbs. at beginning of backpacking trip and I weigh 155 - 165 lbs. (fluctuates more with age!?). I took out the Keen footbed and use my custom orthotics because I have them. Boots definitely run small, so order a half size larger, you may even need a full size larger. Go larger if wondering, feet swell when on them all day. In mountain rain that lasted a few days, my feet stayed dry. With these boots I just splash through streams and remain dry. Even in slushy spring/early summer snow, no problem — repeated layers of snow-seal between trips keeps leather in good shape and water resistant. I wear small gaiters to keep trail rocks out. My feet only felt "overly" hot on lower altitude or desert hikes. Traction is great even on wet rocks. Support for ankles is surprisingly good, better than expected after using heavy full leather over the ankle boots for decades. Have rolled my ankle once or twice in the 250+ miles backpacking in the Keen boot, but it was not an issue at all. Better care in where I walk will probably help. So far is good — no seams coming undone or rubber parts or sole breaking off, cracking or pealing off. Love the shank, keeps the boot stable on rocks yet comfortable on dirt. Flexible yet stiff enough when needed on rocks. The web eyelets on the version I have are not so great but workable. I see Keen has changed that. The top two metal open-eyelets for lacing are great for maintaining proper tightness of lower boot for fit and adjusting for long uphill/downhill treks and different sock thickness. I use the two sock method, with a large thick outer sock, love the extra cushion. One Foot Larger than the Other? I have one foot that is a half size or more larger than the other, and my large foot does need some blister attention on the toes when I am doing 15+ miles per day, but it is manageable. I believe I need a bigger boot for that foot. 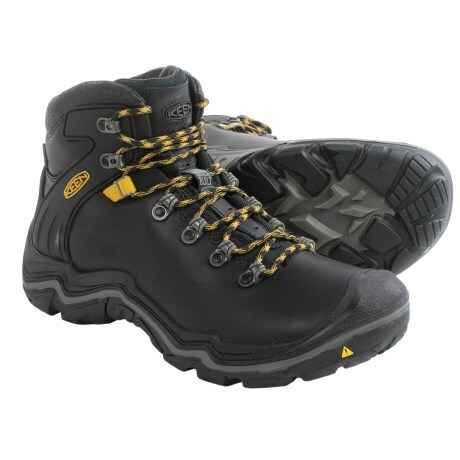 I hope to order two different sized boots as a pair from Keen for my next pair to match my two feet sizes. That would be the frosting on the cake from Keen. Welcome to Trailspace, Backpacker at 60! Thanks for sharing such helpful gear review with us. It looks like you're able to get out to some great spots. I bought a pair of these, wore them out to dinner and hiked Mt. Elbert in them the next day. Stupid, probably. That said, I developed no blisters or hotspots and the boots were light and molded easily to my feet. I have pretty wide feet and short, 61/2 E, think duck. They fit perfectly in the toebox and no problem on the downhill either where I often have trouble with a wide width. The grip of the soles worked well on rock as well as some wet spots from melting snow cover. Since then they have been my go-to boots if I need something more than a trail shoe and less than a technical boot. I love Keen footwear, maybe because everything of theirs I've tried has fit my weird feet, but they have also lasted very well. Thanks for the review, oldslabbber. Solid boot, I go through two or three pairs of boots each year and this boot has replaced my need to find a new one. It has comfort, stability, and is everything I need in a daily boot. For my foot, there was a little rubbing on my ankle for the first week. I have a wide foot and typically my boots will pack out and become sloppy after wearing for 1-2 months, but this did NOT happen with the Keen Liberty until month 8, which was amazing compared to previous boots. I had a bit of rubbing on my left ankle for about 1 week and then I didn't notice it after that. The boot is VERY waterproof and especially good on wet/slippery ground. The lacing system is really well designed and easy to get into the boot and still retains comfort and tight fit. I wear these boots every day and put on 10-15 miles per day and I am very impressed and will stick with the Liberty for the future. I just purchased my second pair and I highly recommend these boots to anyone. Welcome to Trailspace, Chris. Thanks for sharing your Keen review. This boot has the fit that I have been looking for. I had been looking at two other brands that I was familiar with (Scarpa and Merrell) and had researched two models that I wanted to try. But they did not offer the fit that I had remembered. I saw the Keen and decided to try them. They were immediately comfortable, but I was skeptical as almost any shoe is comfortable in the store. I wore them for about two hours in the store, using the fake rock to test them out for fit. What stood out to me was that they had the wide toe box so my forefoot would not be squished, and the heel seemed to fit well with no slipping. I decided to buy them and try them in the house for a while to be sure. I also researched them once I got home and found they were well rated for comfort, fit and wear. I have about 5 hours in them on the trail and they are still comfortable. I haven't worn them in the rain yet, but the soles (I don't think they are Vibram) are very sticky and seem to adhere to almost anything well. So far I am very happy with them. I found I had a couple bone spurs that I never noticed before that really started to cause pain. The one on my right foot especially. I tried a foam donut pad, but it was not enough. Then I tried various lacing patterns. Finally found one that took the pressure off that part of my foot (my spur is on the instep). Now I have hiked for over two hours with no pain on my right foot. My left foot bone spur (am I prone to bone spurs???) is on the right side bump of my ankle. It may be a little more difficult to figure out how to lace up, but I was successful with my right foot so I'll keep on trying until I get it. Lacing only partway works for the pain, but leaves me feeling like the boot is too loose. Anyone have any other suggestions? I still like the feel of these boots. They fit like a glove, which is probably why I am now feeling these bone spurs. But the fit is great. I'll update everyone when I find the answer. I hope you'll keep us posted on how the Keens continue to work out for you, Hikkerman. Thanks for the update, Hikkerman. Good luck dealing with the bone spurs. The Keen Liberty Ridge WP is not available from the stores we monitor. It was last seen March 17, 2019	at Moosejaw.